Following the death of Queen Mary from smallpox in 1694, William continued to reign as William III, with his regnal years continuing to date from 1688. Five guinea coins were only produced in the last three years of his sole reign, the design probably being the work of John Croker under the direction of one Isaac Newton, since James Roettier been dismissed in 1697 and his brother Norbert had left somewhat under a cloud for Paris in 1695. 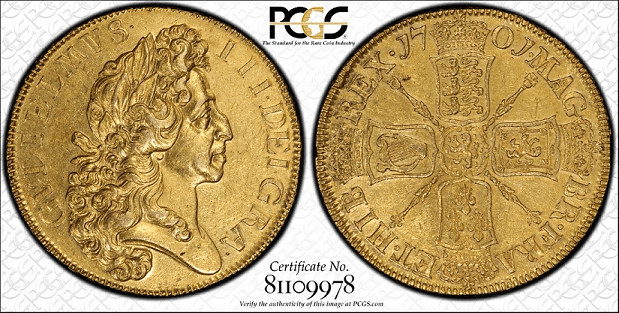 The coins of William III´s reign weighed 41.6g to 41.8g, William’s bust faces right with the legend ; GVLIELMVS III DEI GRATIA, while the reverse design of William and Mary’s reign was judged to be unsuccessful, certainly not an opinion shared by the Numismatic fraternity today, so the design reverted to that of Charles II and James II but with a small shield with the lion of Nassau in the centre. legend around ; MAG BR FRA ET HIB REX and the date split either side of the crown at the top of the coin. A wonderful set of coins for the collector as the 1701 ‘fine work’ completes it’s four coin set making it one of the easier series to obtain, though extremely difficult to find all the coins in Extremely Fine condition, as are the majority of all the Five Guineas, particularly the 1699 Elephant and Castle. The king’s portrait was initially shallowly engraved. And then Isaac Newton came to the mint in 1696. His scientific mind brought discipline to the book keeping and he attended to the coinage designs as few had before him. At the end of December 1699, Newton succeeded to the post of “master worker” or coining chief at the Royal Mint. Newton had by that time no longer the services of the Roettier dynasty so favored a young assistant named James Bull, and then the German engraver of great talent John Croker. The first commission set by Newton for Croker was the re-engraving of dies first made by the Roettiers,the skill of his work soon becoming apparent ,then soon began work on his own individual designs and in 1698-99 he produced the famous “Flaming Hair” shillings of the period. The king’s portrait seen on those shillings bears an uncanny resemblance to the so-called “Fine Work” busts used on the 5 Guineas and 2 Guineas of 1701. The mint’s own records are vague. James Bull may have contributed some effort to the creation of this portrait but the master engraver seems to have been Croker. Similar flourishes of engraving ingenuity are to be found on any number of medals of the period known to have been made by Croker, most of them signed by him. Newton’s first indenture, commission to produce coin, occurred on December 23, 1700. He had taken a particular interest in the fineness of English gold as compared to the French and Spanish gold commonly seen in commerce in England. No record exists specifying that Newton directed Croker to produce the dies used to mint this 5-Guinea coin, of superlative design and gold quality, but the dates of involvement at the mint by both men strongly suggest how this fabulous coin came to be. By far the most common Five Guinea of all is the beautiful Fine Work issue of 1701, which has also had by comparison a larger demand by the general collector whom want to obtain a beautiful example of the Five Guinea. It is a shame that such a beautiful design could not be used in subsequent years due to the demise of William III and perhaps we can speculate that the Five and Two Guinea pieces had such a large mintage due to the demand for them on William’s death.